This real work implementation report has revealed that government plans to introduce real work in prison could raise £9.9m for the public purse as well as £17m per year for victims’ funds. Not only would introducing real work into prisons bring financial gain to the country, but polling has revealed popular support for both the broad policy and elements of how prisoners’ pay is spent. The Howard League has pioneered the concept of real work for prisoners and is the only organisation that has ever run a real business inside prison. 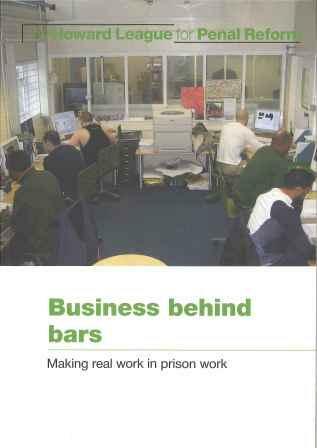 Following an extensive investigation into the work opportunities available to prisoners, the Howard League established ‘Barbed’, a graphic design studio inside a prison, and ran it as a proper business. A design studio inside a prison is unusual – in fact it’s unique. It’s hard to believe this actually worked, but it did – extremely well. Barbed produced work as varied as business cards, annual reports, posters and exhibition banners, plus many more items. The studio had a very positive vibe and there was a real team spirit. This was reflected in the quality of the work. It flourished, and the prisoners/employees paid tax and NI contributions until the Prison Service decided that prisoners were not able to pay either of these. The charity is committed to the principle that long-term prisoners should be properly employed, pay tax and support their families. The Howard League’s implementation plan for real work in prison is based on years of research and the benefit of practical experience.